Tomorrow is the official start of fall and time begin ushering in all the wonderful produce autumn has to offer. Beets are one of falls best bounties. Full of sweetness and bursting with color, beets become tender and packed with flavor when cooked properly, making them an ideal addition to salads, side dishes and soups. 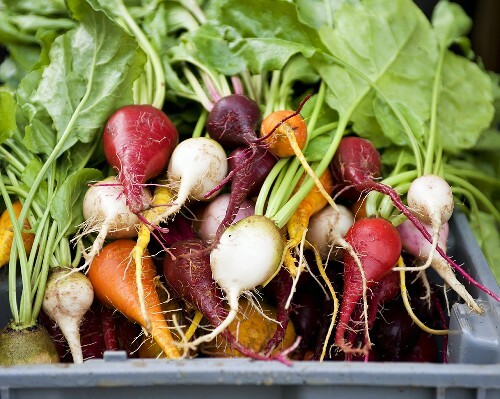 We often think of beets as a root vegetable, however the whole plant is edible. You can use the leaves in salads or sauté as you would kale or Swiss chard. We most often think of red beets, but in fact beets come in a variety of colors including yellow, stripped (called Chioggoa) and white. To find these more unusual varieties your local farmers market or specialty grocery store is your best bet. When picking your perfect beet, look for smooth skins with firm roots. Give the root a little tap, if it feels flimsy move on. To make sure you are getting the freshest, buy beets with the greens still attached. The brighter the greens the better. Once home, keep beets fresh by storing in a cool place like the crisper drawer of the refrigerator. Beet roots last for 2 weeks and the leaves hold for 2-3 days. There are two basic ways to make beets. The easiest method is to place whole, unpeeled beets in boiling salted water and cook until fork tender. When ready, simply use a paper towel to rub the skin off. You can also roast them. For this method, peel and cut beets into pieces and roast in a 400 degree oven with olive oil, salt and pepper until fork tender. You might consider using gloves when handling beets, their juice tend to stain everything from cutting boards, dish towels, counter tops, even your hands! Beets are more versatile than you might think. Try pairing cooked beets with a strong salty cheeses like Maytag blue, Roquefort or sheep’s milk feta. These pairings work great in a simple baby green or arugula salad. Orange is another classic flavor match. The acidity and brightness from the orange plays nicely against the earthiness of the beets. Try whipping up an orange vinaigrette or adding orange zest to you next beet dish. Toss boiled or steamed beets in a composed arugula salad with feta cheese, walnuts, orange slices and a soft citrus vinaigrette. Roast with carrots, squash, turnips and parsnips for a wonderful root vegetable medley to go with nearly any protein. Saute beet greens with spinach or watercress along with ginger and garlic. Add roasted beet wedges into the pan and deglaze with orange juice and cider vinegar. Let the liquid reduce and serve warm. Try adding a few slices of boiled beets on your next hamburger for a unique flavor twist. It’s no surprise a meal is only as good as the quality of ingredients used in the recipe. Yet, when it comes to purchasing meat most consumers seem to forget the timeless logic, “you get what you pay for”. 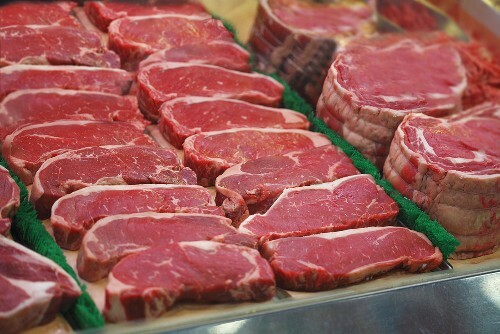 Many of us mindlessly grab the cheapest strip steak or ground beef, whatever is wrapped in the open display cases never giving a second thought to where the meat came from. Whether you are planning a party for 8 or a quiet dinner a home for 2, it’s important to pay attention to the meat you buy. While it might seem crazy to spend $10 a pound for organic chicken, trust me, it’s worth every penny. Look around at the walls, floor, windows and display cases of your butcher or grocery store. If things look dirty from where you stand, the back areas where the meat is stored will likely be dirty as well. Just because a store has a “brand” name doesn’t mean they sell quality meat. Trust you judgement! Take a breeze over the meat display case. All the protein should be organized and separated in different areas. Meaning, lamb shouldn’t be on top of beef, on top of chicken. Cross contamination of proteins can lead to foodborne illness. If you can, avoid purchasing anything pre-packaged in plastic. It’s always better to get something freshly cut. You don’t need to buy the most expensive cut like filet mignon to have a good meal. There are plenty of delicious alternatives like flank or hanger steak that won’t break the bank. Don’t be afraid to ask the butcher where the meat comes from, whether it’s organic or free-range. You will pay a premium for certified organic meat, but it really is worth it. It not only tastes better, but it’s a much healthier way to go. You can tell almost everything you need to know about meat by just looking at it. Meat should look matte and dry, never bloody and wet. Protein that is bloody tends to be flavorless and tough. Quality beef has a dark red, almost purplish hue and creamy white threads running through it. The white threads, called marbling, is what gives meat flavor. High quality pork, like beef, should be dry and without blood. Likewise, always look for chicken that has Chicken creamy white or yellow skin without any blemishes or bruises. 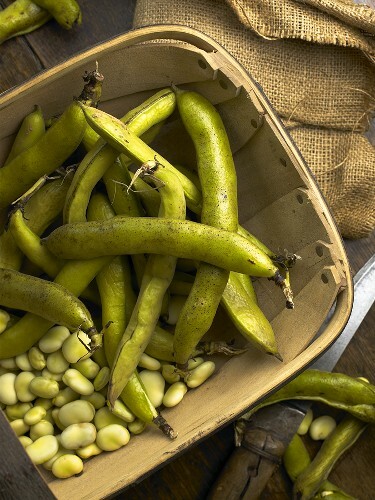 Fava Beans are large, light green and sometimes called Broad Beans. They have a nutty, sweet and slightly bitter flavor. Fava’s grow in pods just like classic peas and when cooked turn beautifully buttery. This versatile little bean can be added to soups, salads, pastas, braised as a side dish, pureed as dip, or eaten plain like edamame. You can find them year around in the freezer section of the grocery, but there’s nothing better than grabbing them fresh from the market, and shucking yourself. They are a true spring delicacy! When picking these guys out at the market, look for pods that feel heavy and medium sized. The larger ones tend to be starchy. Pop the beans out of the fleshy pods and blanch in a pot of boiling water from 30 second to 1 minute. Drain and run under cold water. Take each bean in between your fingers and carefully remove the outer skin. You might want to use a pairing knife for this. Depending on how you are planning on using the favas you can blanch the skinless beans again until tender or simmer in warm water with butter and oil and braise. As a riff on a classic white bean dip, replace the white beans with blanched favas. Throw into a blender with garlic, olive oil, salt, lemon and a little rosemary and serve over some crispy toast points or with crudités. Saute with some proscuitto, mint and garlic and serve as an accompaniment to a pan seared white fish like cod or halibut. Add fava’s to an antipasto platter. Boil until tender, drain and run cold water over them. Serve with a little salt and olive oil drizzled over. Tastes delicious with thin slices of salami, cured ham, good cheese and crusty bread. In early spring Ramps begin to pop up in wooded areas and along stream beds. They look like large scallions and taste similar to a cross between garlic and onions. 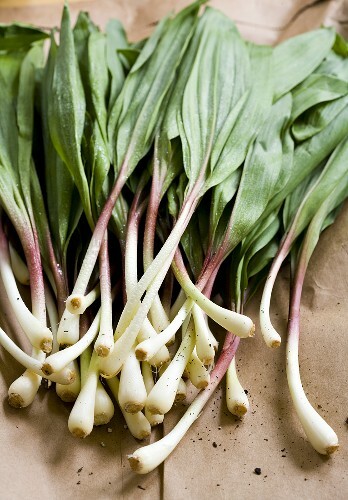 Fresh Ramps have a very pungent smell with an almost spicy kick. However, when you cook them their flavor mellows and they add a wonderful punch to a meal. Take advantage of these guys in the first few weeks of spring, after they become difficult to find. Like scallions, the leafy green tops tend to be milder than the white bulbs at the bottom. Common preparations include sautéing, and roasting but you can also grill. Ramps and Morel Mushrooms make a wonderful pairing. Trying sautéing and adding to a Spring Risotto with peas and asparagus. Char-grill them and serve alongside a grilled hanger steak or chicken breast. Before serving squeeze some fresh lemon juice over the ramps to brighten the flavor. Use in place of scallions on top of a baked potato with sour cream and cheese. For a spring brunch, sauté ramps and add to a classic Quiche Lorraine filling.